Inauguration of Renovated and Modernized Silviculture Museum Gallery at Forest Research Institute Dehradun:Sh. 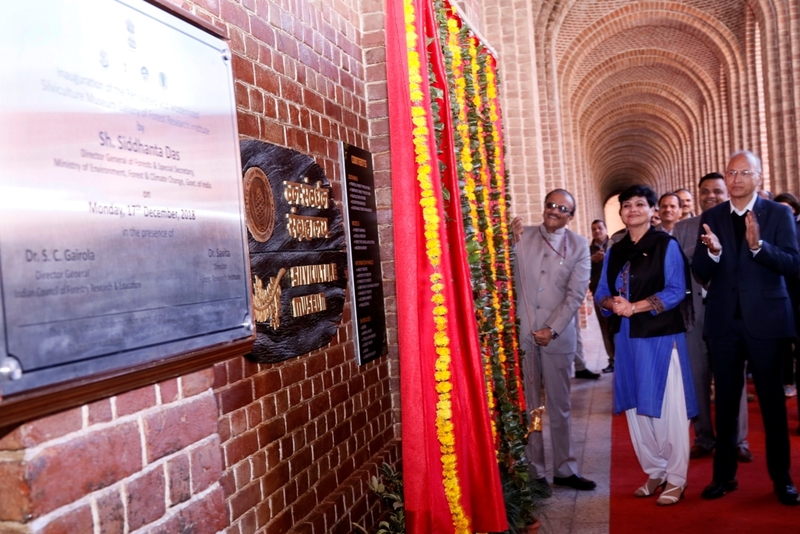 Siddhanta Das, Director General of Forests and Special Secretary, MOEF&amp;CC, inaugurated the renovated Silviculture Museum Gallery of Forest Research Institute, Dehradun, in the presence of Dr. S. C. Gairola, Director General, ICFRE and Dr. Savita, Director, FRI on 17 December, 2018.The renovation and modernization work of the museum gallery has been funded by Ministry of Culture, Govt. of India. The inauguration was attended by all heads and scientists of the divisions of FRI; the DDGs, ADGs from ICFRE; representatives from organisations like IGNFA, CASFOS, ISWC, WII, Regional Office, MoEF&amp;CC and the senior officers from the State Forest Department of Uttarakhand. While addressing the media personnel,Sh. Siddhanta Das, emphasized that the modernisedmuseum gallery will enable the visitors to understand the evolution and historicevents of forestry in India. He further added that focus is now on the importance of different types of forests for ecosystem services, biodiversity support in our life. He congratulated the Director FRI and her team for their wonderful and tireless efforts. He said that the visitors would be immensely benefitted by the information provided in various panels and would also get educated on various aspects of forestry.Shri Siddhanta Das in his statement also explained that Silviculture is the theory and practice of controlling the establishment, composition, constitution, and growth of forests. Dr S.C. Gairola, Director General, ICFRE appreciated the efforts made by FRI under the leadership of Dr Savita for conceptualizing and executing the modernization works of the Silviculture Museum Gallery. Dr. Savita, Director, FRI said that we take our educational role very seriously and we hope the students and other visitors of FRI will go better informed about the role of forests in saving the environment and be inspired to contribute towards greening of our planet by way of planting more trees. The Silviculture Museum Gallery showcases the evolution of forestry in India, importance of forests, threats to forests like Deforestation, Forest Fire, Shifting Cultivation, Invasive Plants, Adverse Climatic Factors, Insect Pests and Diseases, through creatively designed informative panels. It also highlights the accomplishments made in forestry along with the preparation &amp; implementation of working plans for organized forest management.The Museum also has various Dioramas depicting the Forests of Tropical &amp; Temperate region, Silviculture Systems, Ecosystem Services and Sustainable Forest Management along with different samples of seeds, roots, barks etc. along with various models on Forestry working and operations have also been exhibited. There is a very interesting panel showing the dimensions of forestry especially in terms of relationship between social, economic and ecological facets. The other corner has all the important publications presented in a very artistic and creative manner. There is one shelf devoted to changing faces of ‘The Indian Forester’ the third oldest Forestry Journal in the World being brought about by FRI, since 1875 uninterruptedly. There are showcases exhibiting nursery tools &amp; accessories, mensuration tools, rock samples, forest fruits as well as harvesting, pruning and extraction implements. Amongst the models there is also a model on forest fire surveillance systems which would be appealing to the public visiting the museum. The renovated Silviculture museum was declared open for general public after the formal inauguration today.